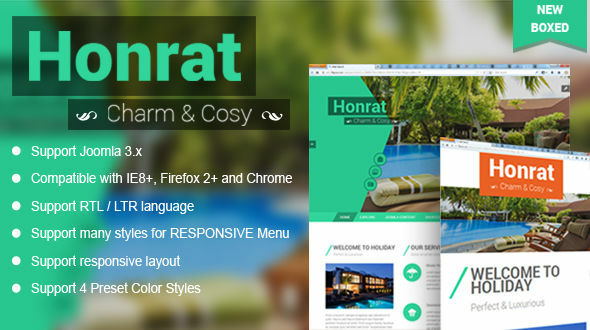 SJ Honrat comes with innovative flat design, vibrant color and sharp layout. We believe that your visitors will be impressed by this template at first sight with large full width slideshow, which allows you to show the most beautiful scenes. More than that, this template is extremely flexible with lots of useful shortcode, 2 layout styles: Wide and Boxed with highly customizable backgrounds, RTL language… Therefore, it is truly suitable for hotel, spas, hostels and guest houses or resorts websites that bring viewers fresh and comfortable feeling. Along with the unique layout, this responsive template is equipped with YT Framework v2, K2 component and a wide range of powerful extension. It provides all the necessary features to create an outstanding and attractive hotel and resort website. Now let’s take a SJ Honrat tour to feel more!